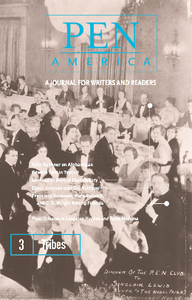 Tribes features PEN tributes to Langston Hughes and Yukio Mishima and features writing by authors such as Edward Said, Denis Johnson, Seamus Heaney, Sandra Cisneros, C. D. Wright, Tony Kushner, and Sherman Alexie. PEN members discuss their literary tribes. Arnold Rampersad, Willie Perdomo, Sonia Sanchez, Margo Jefferson, Langston Hughes, John Nathan, Jay McInerney, Hortense Calisher, Eikoh Hosoe, William T. Vollmann.